Mary, the earth mother of Jesus, is one of the most beloved of the many figures in Jesus life. The Urantia Book reveals Mary to be a conscientious, loving, and totally devoted mother to her "child of promise." We learn of Mary's personality, her lineage, and her education; we learn the dates and names of all the children who she brought into the world as Jesus' siblings. We see Mary as a mother not at all unlike any other mother, and we are told that Mary, in spite of the cult of worship that bears her name, was a fairly ordinary woman, but an ordinary woman called to perform extraordinary service to our planet and our universe. And she performed her duty as a mother with exemplary attention, and great mother-love. 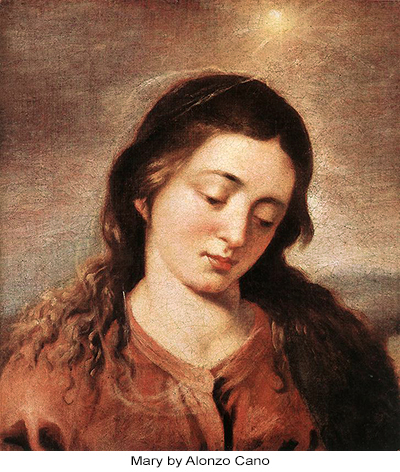 The life she shared with Joseph, Jesus, and his siblings was an inspiration in Jesus' time, and is presented anew within the pages of The Urantia Book as a testament to love, and an inspiration for the times in which we now live. Please click on any of the links to expand the story; and for the most complete understanding of Mary, set against the backdrop of the Earth mission of the Son of man, Son of God, please read Part IV of The Urantia Book. Why Was Mary Chosen To Be Jesus' Mother?